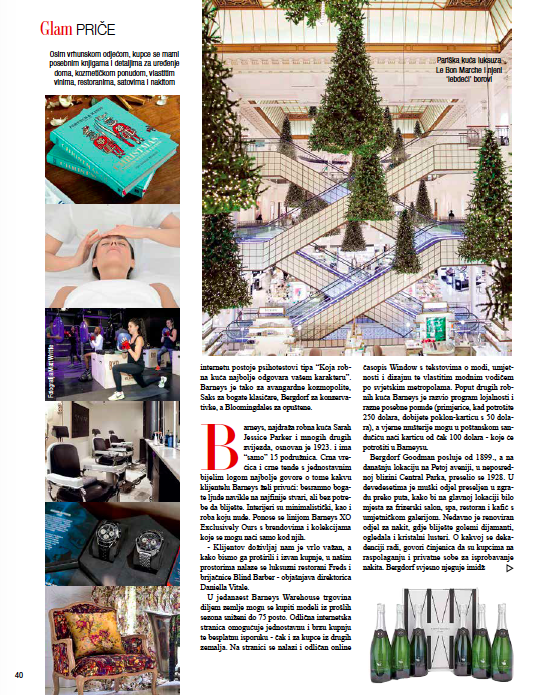 When my editor asked me if I would write a story about world’s most luxurious department stores and their strategies for dealing with competition coming from Internet shopping, I immediately said yes. The mix of luxury, most beautiful places in the world, cultural differences and strategic marketing sounded endlessly appealing. But what I found out was sad more than exciting. I learned that people are so overshopped that just buying (expensive) things isn’t enough anymore – to attract shoppers, department stores had to turn themselves into wonderlands. Every manager I spoke to talked about “creating an experience” – today, department stores are real palaces of decadence offering spas, gourmet restaurants, champagne bars, barber shops, personal stylists, shopping assistants, event managers, interior designers, flower decorating workshops, pop up stores, special events, even cinemas and ice rinks. How did we get so bored?